Some days you just need some carbohydrates slathered in butter, sugar and spices. Yesterday my flatmate and I were having a distressing day. I find baking the best solace so headed to the cookery books and came up with these: my flatmate was on a carb binge and I was craving sugar - these ticked every box. 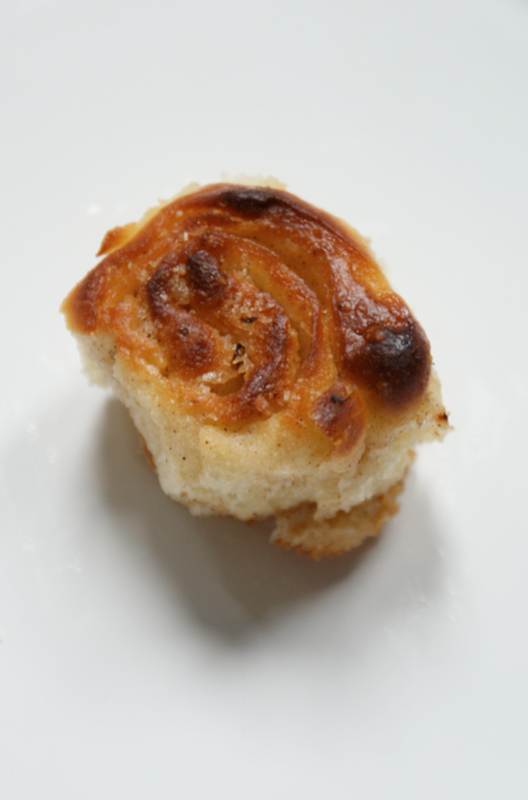 I halved the recipe for our own safety and made mini rolls instead. I first made these five years ago when an old friend and I were sitting around on Valentines day moping about being 15 and single. Well, she was moping - I've never found Valentines day particularly problematic. 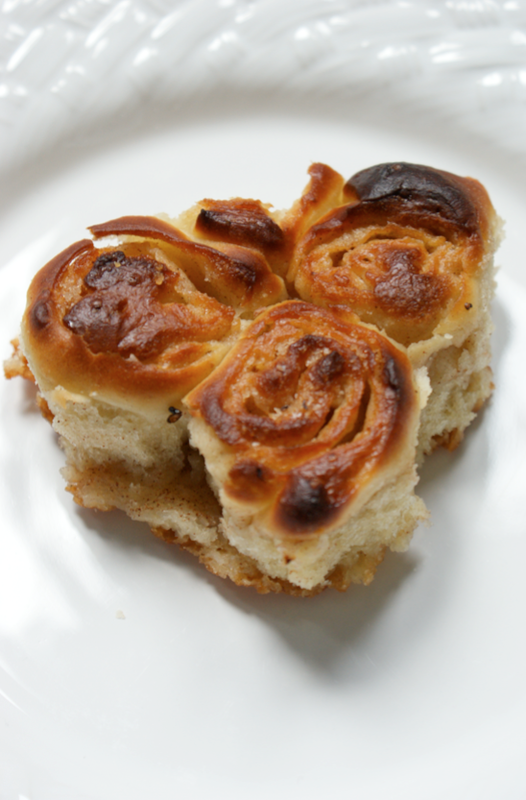 Still, these buns are wonderful and put smiles on both of our faces and it seemed appropriate with Valentines coming up again (and amusing when I realised these three look like a heart...). They're not very hard to make - just reassuringly complicated. They're perfect for that afternoon when you want to busy your hands, not think about anything, just knead some sticky dough and watch it rise. They filled our apartment with the warm scent of yeast followed by an amazing fug of caramelized sugar and cinnamon when they were baking. It's a truly comforting smell. Sift together the flour, sugar, salt and yeast together into a bowl. Measure out the milk then add the egg and beat in. Melt the butter and whisk into the milk mixture. Stir into the flour mixture until it combines. Mine was very sticky. Turn out onto a floured surface and knead until smooth and springy - as it was so sticky I got the dough everywhere but it did come together and get quite elastic after kneading. Put into a lightly buttered/oiled (with a heavily flavoured oil) and cover tightly with clingfilm. Place in a warm place and leave it to rise for about half an hour. (I also wrapped mine in a tea towel). Preheat the oven to 230C. Take a spare third of the dough (I overdid this and ended up with a thick bottom and small rolls) and roll out to a rectangle that fits into your tin, which should be lined bottom and sides with baking parchment (I used a 23 x 15cm brownie tin). Roll out the rest of the dough on a floured surface, attempting to get a rectangle - I rolled mine quite thin, to about 40 x 20 cm, but less would work. Beat the butter, sugar and cinnamon together in a small bowl. Spread the rectangle with the filling, trying to get a fairly even cover. I had some spare so I also spread some on top of the dough in the tin - I liked the way this made the bottom extra sticky. Roll the rectangle up from the longest side, to create a big sausage. 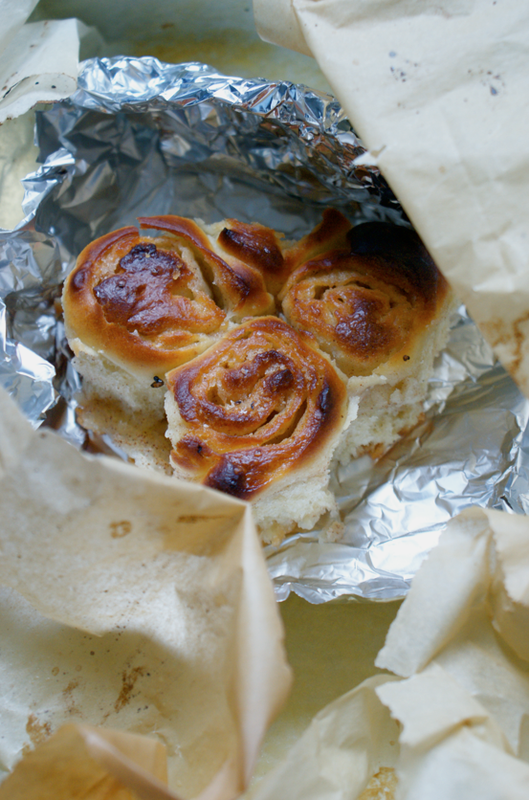 Cut the roll into 2-3cm slices then arrange them in the tin, swirls facing upwards. They'll puff up so don't worry if there are gaps. Brush them with egg or with milk. Wrap the tin and baking parchment up in clingfilm and put back in the warm place for about 20-30 minutes or until they're puffy. Pop into the hot oven and bake for about 20 minutes or until they've risen and are golden brown - they will go quite dark brown in places but that's part of the charm. Remove them from the tin with the parchment and set on a cooling rack then start tearing them off - make sure you eat them warm, they're by far their best. You can quickly reheat them in the oven or even the microwave. Makes about 20 mini cinnamon rolls. My goodness--I just got that Domestic Goddess book from the library this very afternoon, AND lately I've been pondering making cinnamon rolls like yours. How serendipitous! I love your characterization of the recipe as being, "reassuringly complicated." That's very apt, and I know just what you mean! Oooh goodness these look gorgeous! Sticky, sweet - divine! Just made these as a 'last day before college' treat. They're SO unbelieveably tasty! I sometimes stuggle with recipes because they require ingredients we haven't got in the house, but these are perfect - Amazing what you can do with storecupboard essenstials! They literally made my day, I want to make them all over again, thankyou, thankyou, thankyou! There is lots of talk and hype on the internet nowadays about keyword research devices for search engine optimization. utilize are the keyword research tool features of the software. cost-free Google AdWords and AdSense external keyword device provides you. Checkout this blog for more Long Tail Keyword Tool.